The least touristy of all the balconies over Florence sits under the village of Settignano. The road up passes by way of Ponte a Ménsola, where Boccaccio spent his childhood in the Villa Poggio Gherardo, and where it is believed he set the first three days of The Decameron. In the 9th century, the Irish Bishop Donatus of Fiesole and his Deacon Andrew Scotus founded the abbey of San Martino a Mensola, just beyond the villa on a little square. Rebuilt in the 1400s, the church has three good trecento works: Taddeo Gaddi’s Triptych of the Madonna with SS. Lucy and Margherita, his son Agnolo's panel paintings St Andrew’s Casket, and on the high altar another triptych by the school of Orcagna, dated 1391. From the quattrocento there’s a Madonna and Saints by Neri di Bicci on the first altar on the left. If you leave the church and keep left, you’ll soon come to Villa I Tatti, on the enchanting road up to Fiesole. If you turn right instead of left at San Martino a Ménsola you’ll come to Settignano, a delightful bourg surrounded by villas. During the Renaissance it was a cradle of sculptors, producing Desiderio da Settignano and the brothers Antonio and Bernardo Rossellino; Michelangelo spent his childhood here as well, in the Villa Buonarroti. Not one left anything behind to remember them by; the good art in the parish church of the Assunta is by Andrea della Robbia (an enamelled terracotta, the Madonna and Child) and Buontalenti (the pulpit). 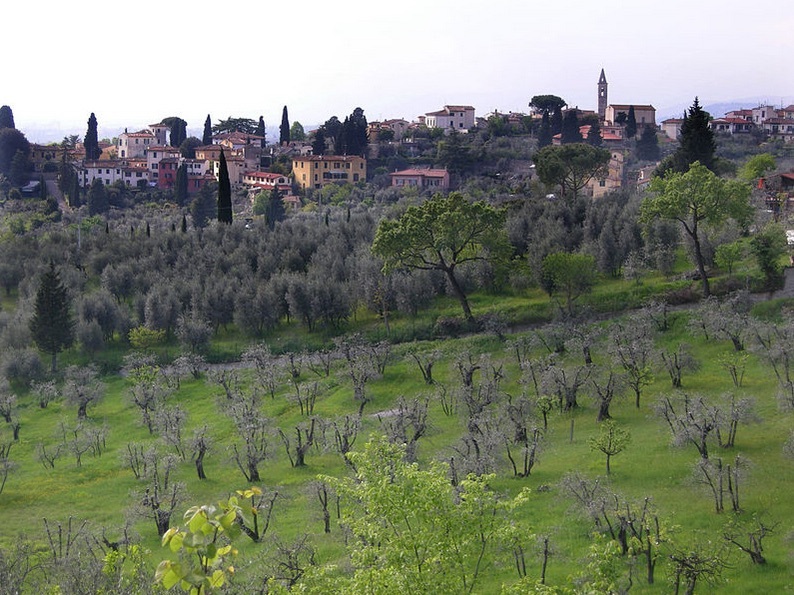 There are, however, splendid views of Florence from Piazza Desiderio or from the stunning gardens of Villa Gabreraia, and a couple of places to quaff a glass of Chianti. Bus 10 from Piazza San Marco.